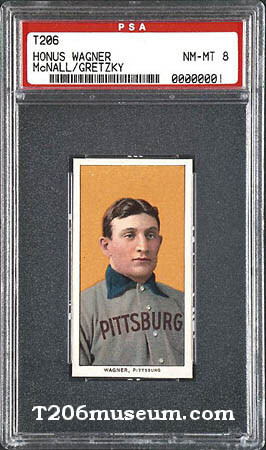 A near-mint condition card depicting the Hall of Fame Pittsburgh Pirates shortstop, issued in 1909 by the American Tobacco Company, fetched a winning bid of $1.1 million Saturday on the eBay online auction house. The winning bidder, whose identity was not released, will pay $1.265 million, which includes a 15 percent buyer's premium. Robert Lifson, president of Robert Edward Auctions in Watchung, N.J., confirmed the sale price but said the buyer had not decided whether to make his name public. Bidding on the card began at $500,000 on July 5, and 13 total bids were made. The card, widely regarded as one of the rarest and most coveted among collectors, is the finest known specimen of about 50 Wagner cards known to exist from the 1909 set. Known to collectors as the T206 set, it remains the most collected set of baseball cards ever. "We've had several very high-priced items, but unfortunately because of the sheer volume of items we don't have a list of highest auctions," eBay spokesman Kevin Pursglove said. "But it's safe to say that this Wagner card is in the top two or three." The card, won in an auction for $640,500 by renowned Chicago-based collector Michael Gidwitz in 1996, broke its own record for a sports card. "I had a great time with this card and I'll miss it," Gidwitz said. "I had a good time buying it and I wish the person who won it has as good a time with it as I had." Gidwitz, 50, said he has been collecting baseball cards and other memorabilia for 42 years. His extensive collection includes uncut sheets of baseball cards and rare original paintings of comic books and MAD magazine covers. "The money's nice, but I sold this card to draw attention to the other things I have in my collection," Gidwitz said. "I owned it for 3 years and 10 months, and decided I wanted to sell it if I could have fun doing it. I certainly had fun and I feel like I'm in the card-collecting hall of fame." The Wagner card was bought for $461,000 in 1991 by hockey star Wayne Gretzky and Bruce McNall, then owner of the NHL's Los Angeles Kings. The card was later sold to Wal-Mart, which raffled it off in a national promotion. The winner, Patricia Gibbs, a Florida postal clerk, immediately sold the card so she could afford to pay the taxes she owed for winning it. Gibbs consigned the card to Christie's of New York City, which sold it to Gidwitz. "I never thought I'd get it," Gidwitz said. "I wanted to know that I had the best card in the world. If you ask people in card collecting, this is the Mona Lisa of our hobby. And now, someone else will be able to have some fun with it."